Home / Education / Music Educator ResourcesBecome A Member! The Music Educator Guide gives a brief overview of the barbershop style, including vocal production, ranges and transpositions, tuning, and interpretive considerations. Explore numerous songs accessible for students starting out in barbershop through the Music Educator Songbook. Basic tags and warm-ups for Music Educators to try with their ensembles. Distinct programs for singers in grades 6-12 and post-high school offer ensemble options to fit your skills and interests: men’s, women’s, or mixed voice quartets and choruses. Hear from other music educators about the impact barbershop harmony has had in their classroom and pedagogy. The Barbershop Harmony Society currently has 700+ local chapters scattered across North America who would love to support you. Your journey doesn't stop here. Consider joining our community. The Music Educator’s Guide to Barbershop includes a guide to the barbershop style, songbook, learning CD, and sampler CD, all freely available to all music educators. Make amazing vocal harmony! Regardless of age or experience! 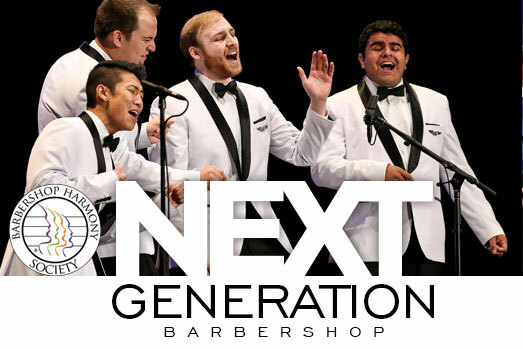 Next Generation Barbershop helps singers up to age 25 discover a sound that’s uniquely their own. Distinct programs for singers in grades 6-12 and post-high school offer ensemble options to fit your skills and interests: men’s, women’s, or mixed voice quartets and choruses.